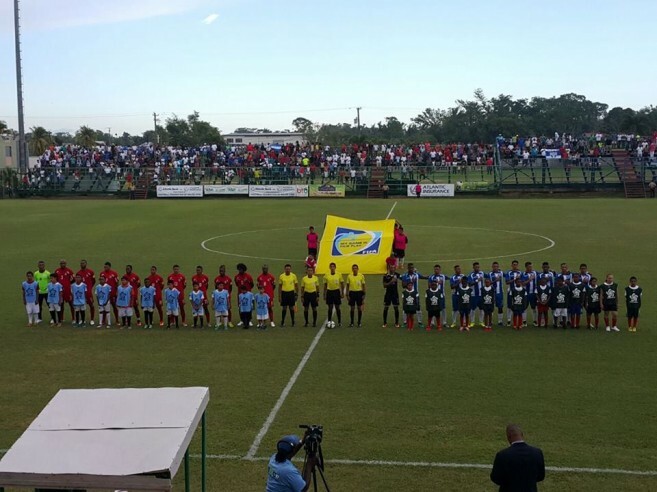 The Belize National Football Team (Jaguars) took on the National Football Team from Honduras in an international friendly match on Saturday, October 4th at the Football Federation of Belize (FFB) stadium in the city of Belmopan. The Jaguars gave the Catrachos a tough game, but lost to the visitors in a 2-1 game score. The game started at 4PM and Belizeans from many parts of the country made their way to the FFB stadium to support the national team. Among the well- known Belizean football stars was Belize Pro Footballer of the Montreal Impacts, Michael Salazar, who travelled to Belize to play in the match. The game was in preparation for the upcoming matches on the road to the World Cup Russia 2018. First to score was the Honduran team, when Romell Quito dribbled the ball and passed the ball to Bryan Acosta, sending it flying past Belizean goalkeeper Woodrow West, and into the net. Honduras was up in the score, but the home team made a strong comeback with its visiting star Salazar. Shortly after Honduras scored, Salazar, via a free kick, passed the ball to Elroy Kuylen who overcame the Catracho’s defense and tied the game 1-1. The crowd roared in delight, chanting and rallying on the Jaguars. At first half, the game was even. However, during the 68 minute in the second half, a penalty shot was called in favour of the visitors. Honduran player Johnny Leveron took the shot, but West was more than ready and blocked what could have been the second goal for Honduras. The game became tougher and the Belizean team was fierce in its attempt to change the score of the game. A powerful shot against the visiting team goalpost almost top the score in favour of Belize. But then at the 67 minute, Catracho Brayan Breckeles fouled near the goalpost area, and Salvadoran referee Ismael Cornejo, called a penalty against Belize. This time, Oscar Salas took the shot and scored the second goal against the Jaguars. During the injury time, Belize tried its best to even the score, but the time ran out and Honduras walked away with the victory in a final score of 2-1. Fans applauded the Jaguars’ performance, in particular goalkeeper West, who stopped many shots from making it into the net. Congratulations to the Jaguars on a well- played match!